I cooked all week!!! Well, thats sorta a lie. 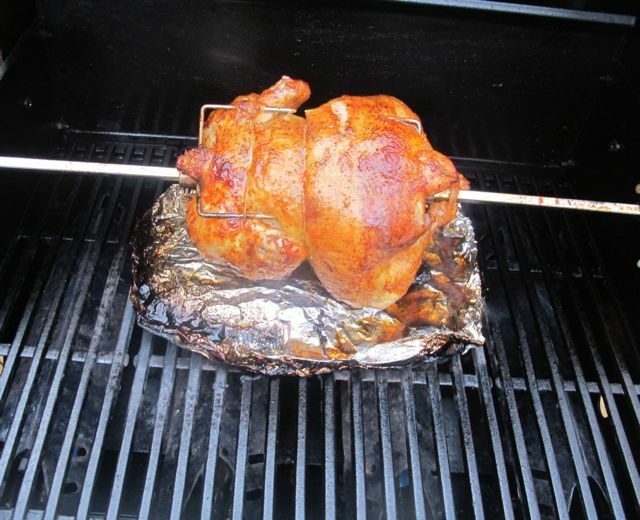 On Friday we cooked Rotisserie chicken on the grill again while watching the Celtics. 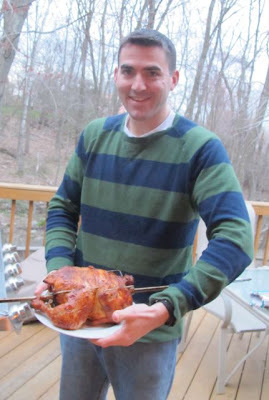 Dave took the lead on this and in the end, we had this beautiful, crispy-skinned chicken ready to eat! I mean c'mon, look at this beauty. 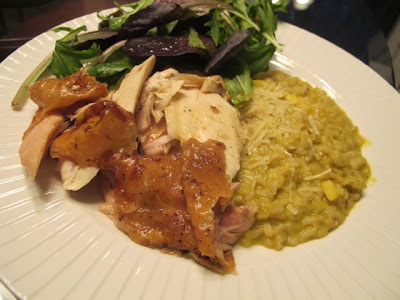 We sliced the chicken and served it with risotto and a side salad. Perfect Friday night meal! I decided to stick with the chicken theme for this week. I made a thai chicken salad with the leftover meat that was decent but nothing to write home about on Monday. But... I did make two chicken THIGH dishes that were pretty tasty. 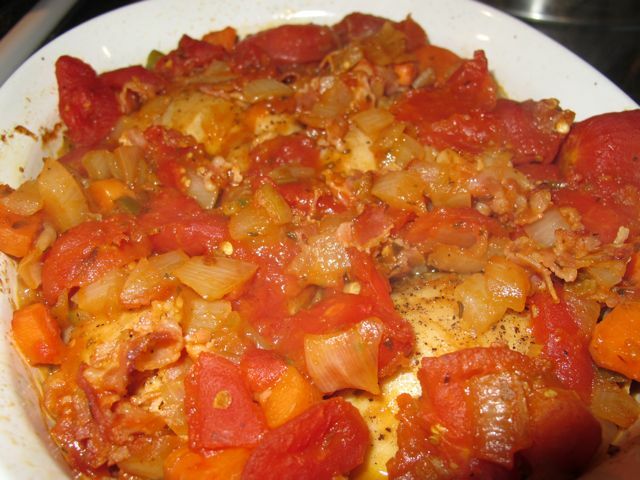 I'm a big fan of chicken thighs- have so much more flavor than white meat. 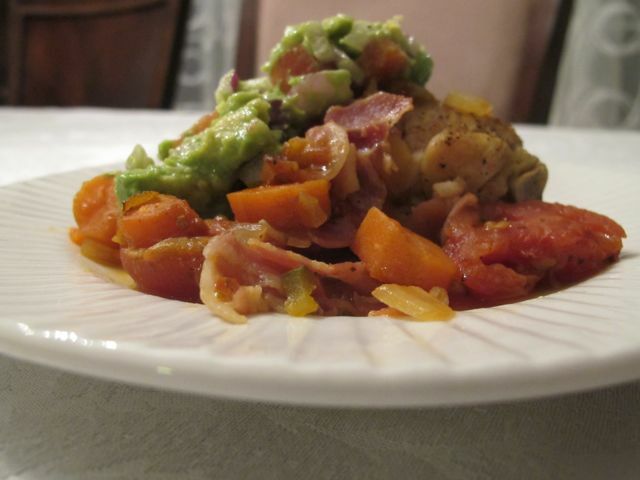 The first dish I made was one from Rachael Ray for Chipotle Chicken Thighs with Guacamole. Such an explosion of flavors. And I loved the heavy on veggies, light on meat. On the same night, I also cooked the remaining 4 chicken thighs (I was using a family pack) using a recipe from Williams and Sonoma that I changed up. Ive wrote about this before, but I do this often. I love cooking two dinners in one night so all I have to do the next night is heat it up! Being gone from my house for 12 hours everyday makes it virtually impossible to be motivated to cook elaborate meals every night so cooking once and eating twice works for me! The other meal I made was out of my Grilling and Roasting Williams Sonoma book: Smoky and Spicy Chicken Thighs. 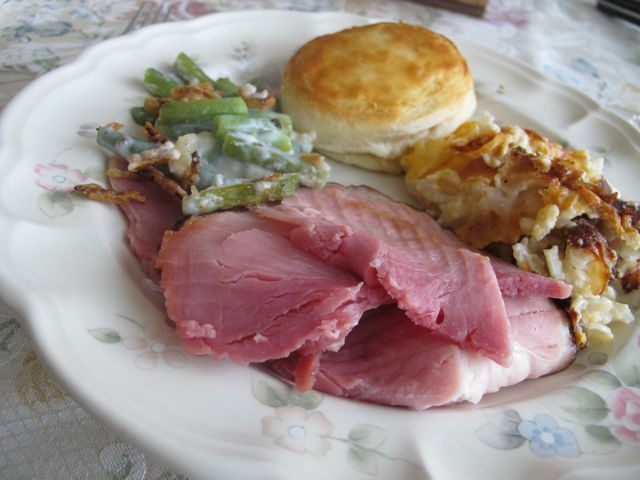 The best part of this dish was I used Stonewall Kitchens Red Pepper Jelly! I love the combination of sweet and spicy. Its definitely my favorite tastes! Preheat oven to 400 degrees, Cut the pancetta in narrow julienne strips. 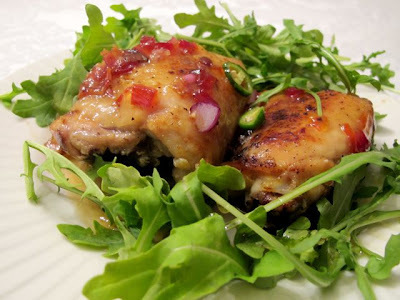 Season chicken thighs with salt and pepper and place in a baking dish. Sprinkle the pancetta slices of top. Roast, basting with pan juices after the first 15 minutes until the skin is crisp. Meanwhile, in a small sauce pan over high heat, warm the jelly until it melts. 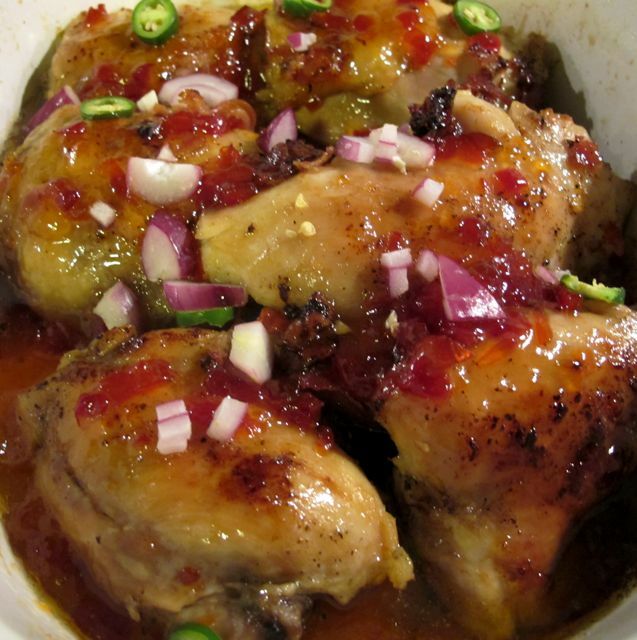 Remove chicken from oven and brush or spoon 1 teaspoon of jelly on top of the crisp skin of each chicken piece. 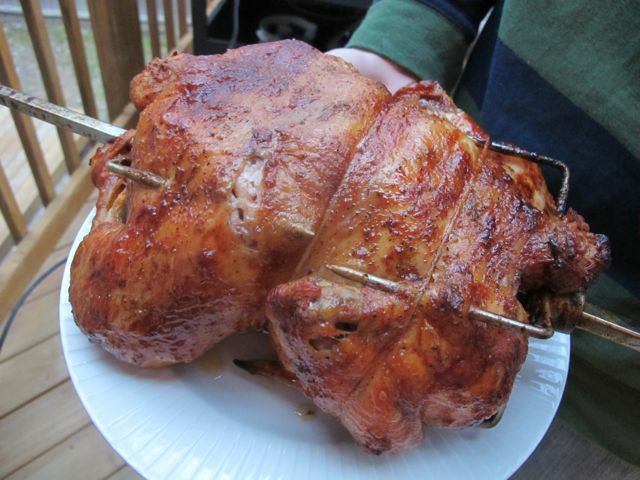 Continue roasting until the skin is glazed and the juices run clear- about 40 minutes total. Garnish with jalapenos and red onions. Serve with an arugula salad and use pan sauce as dressing. Do you like Chicken Thighs? Do you enjoy sweet and spicy combinations? What a family weekend! Saturday we celebrated Passover & my birthday at my mothers. Due to the marathon, we pushed everything off. My family is Jewish and my husband is Protestant but we still share all holidays together. Although no one in my family is very religious, I do feel spiritually religious and connected to my faith. 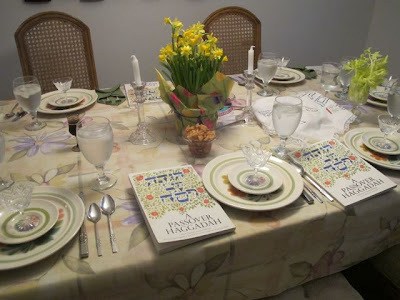 We had a mini-sedar before chowing down on amazing food. 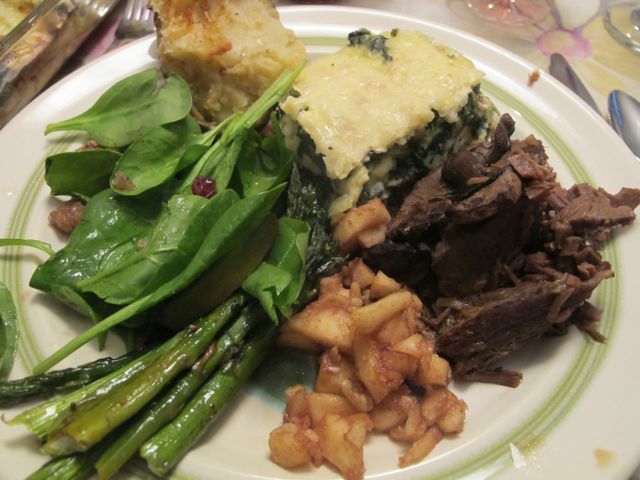 Left to Right- Spinach salad, roasted asparagus, Charoset (Apples and Cinnamon), Brisket, Spinach Matzoh Pie and Baked Potato. Everything my mom made was absolutely delicious. I think my mom and I have very similar tastes! 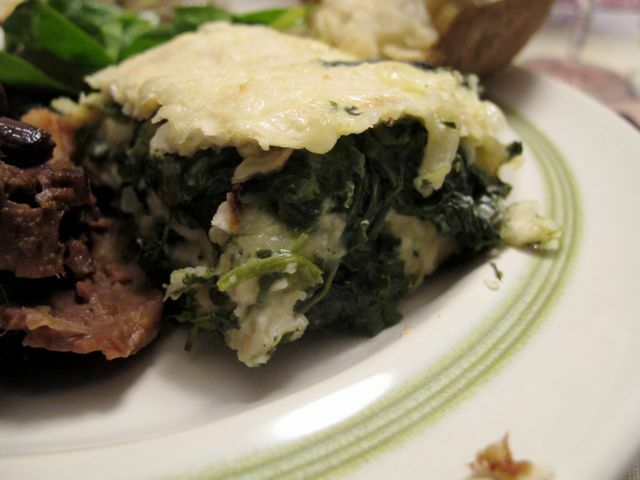 Intrigued about by the Spinach Matzoh Pie? So was I! I originally planned to make this for Cara's Blogger Sedar but I was too sick to go. 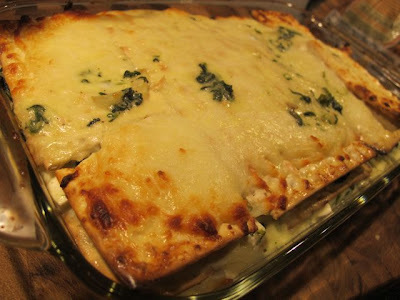 So I made it Saturday and let me just tell you- I think I will make this again even when its not Passover!!! It was a mix between a lasagna and spanakopita. 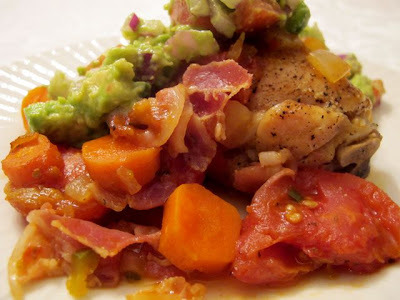 I loved every bit of this recipe! Check it out! Cook onion in oil in a large heavy skillet over medium heat, stirring occasionally, until golden, 12 to 15 minutes. Meanwhile, try to get out as much liquid as possible in the spinach. Add spinach to onion and cook, stirring occasionally, 5 minutes. Remove from heat and stir in salt and pepper. Purée cottage cheese in a blender with milk, eggs, nutmeg, and 1/2 teaspoon each of salt and pepper until smooth. Reserve 2 cups in a bowl and stir remainder into spinach with 1 cup feta. Stack matzos in a deep dish and pour reserved cottage-cheese mixture over them. Let stand 15 minutes to soften. Arrange 2 soaked matzos side by side 13- by 9- by 2-inch (3-quart shallow) baking dish. Pour in half of spinach filling. Cover with 2 more matzos, then pour in remaining filling. Put remaining 2 matzos on top and pour any remaining cottage-cheese mixture over them. Sprinkle with remaining 1/2 cup feta and mozzarella cheese. Bake, uncovered, until golden and set, 30 to 35 minutes. After dinner, we celebrated my birthday which was on Wednesday. 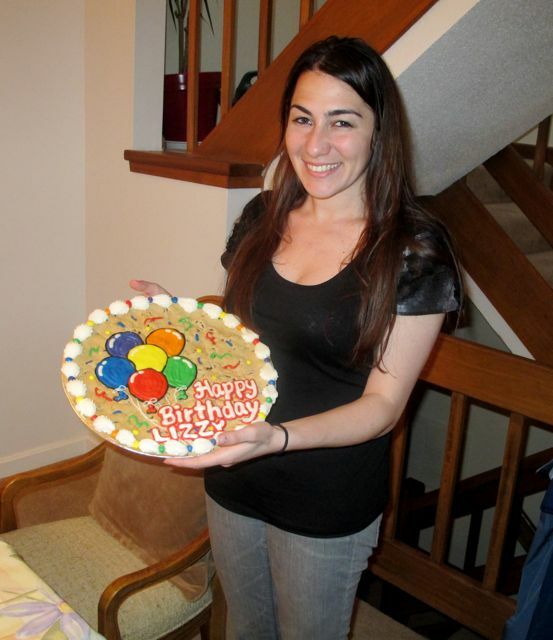 I've had cookie cakes for as long as I can remember. I can't imagine celebrating my birthday without one! PS- I know it makes no sense that we ate cookie cake during Passover dinner- but what can I say- we aren't very religious!! Happy Birthday to me! 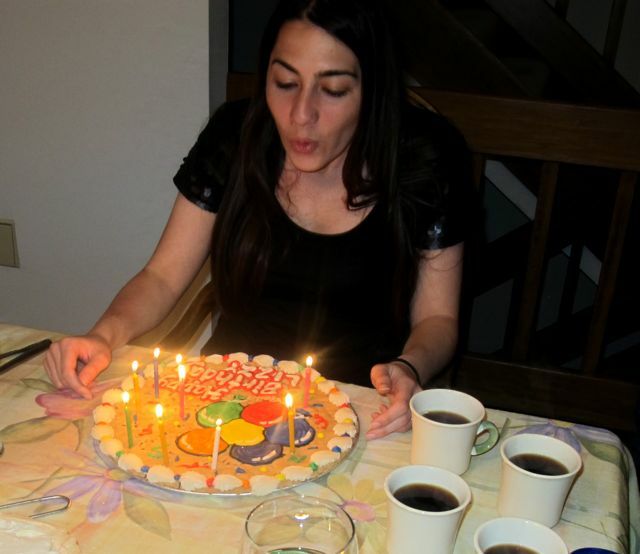 Making a wish! 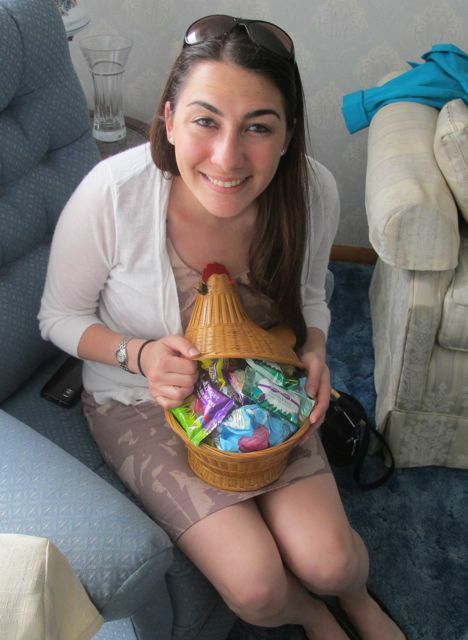 But the best part of Easter- getting my Easter basket! Being Jewish, I never got one growing up so I love that Dave shares his with me! How do you celebrate the holidays? Do you get a specific cake for your birthday? I ran the Boston Marathon on Monday. From the gun, I attacked my race plan which was to go out in under 9 minute pace. My first 4 miles I was on pace. And then I realized how hot I was and I began struggling. From mile 6-20, I struggled. A lot. I walked probably 40X. I drank probably a gallon of gatorade. I almost quit. But then my last 6 miles, I had fun. I was still slow (for me) but I enjoyed the end of the race. I should easily be able to run under 4:20. I've run a 1:50 half. But I keep hitting mental and physical road blocks and my times end up being consistently the same. I'd be lying if I said I wasn't embarrassed by my time. I know I barely trained for this race but I just know in my heart of hearts I SHOULD be able to run faster. 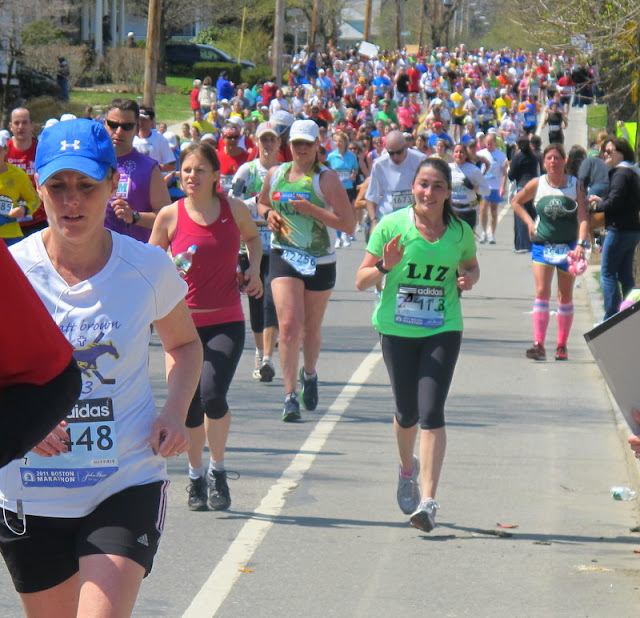 And although I said I was going to "quit" the marathon, I know thats not possible. I can't quit before I've run a successful marathon, I just can't. I want to run a marathon where my splits vary in seconds, not minutes. I want to run a marathon where my pace is under 10 minutes. 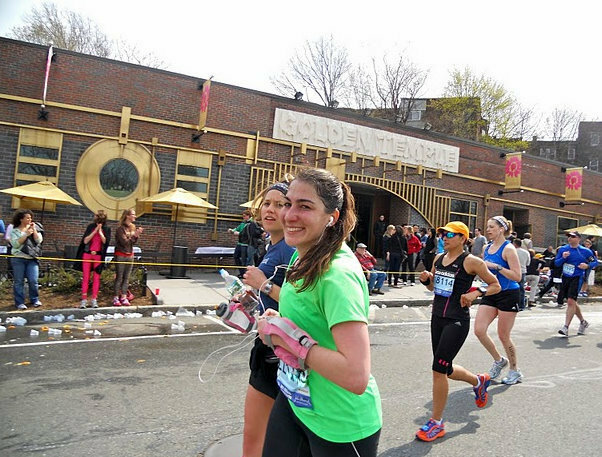 I want to run a marathon where my second half isn't 20+ minutes slower than my first half. My friend Lindsay's mom emailed me after the marathon asking how I did. I sent her the link to my recap. Among other inspiring things, Judy wrote "Marathons are really hard on everyone (even though not everyone is as honest)." I'm brutally honest with you guys about my bi-polar relationship with running. It's almost abusive. I love it. I can't live without it. Yet, sometimes it tortures me and I struggle. I think I'm finally realizing that in order to have more love in my life for running, I need to train smarter. I'm not running to the computer to sign up for another marathon. But if I do run another (which I think I will), I need stronger workouts. I spent yesterday morning strategizing with Corey on how I can do this. We've come up with this: I will run 4 days a week, with each run having a solid purpose. I'm consistent with my Speed Workouts so I will continue those. I will also add a Tempo Run where I learn to hold a faster-than-comfortable-pace for longer-than-comfortable. I will do a "Marathon Pace" Run between 4-8 miles. My projected marathon goal pace will be 9 minutes. 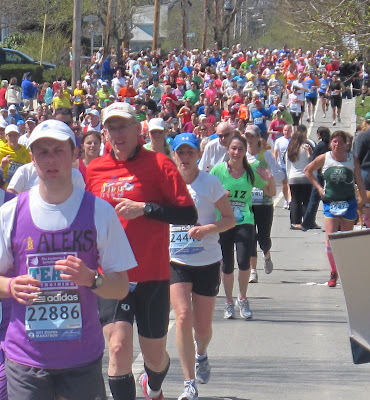 I want to run as close to a 4 hour marathon as possible. There I SAID IT. And lastly, I will do a Long Run and I will spend more time keeping a consistent pace. I'm determined to become the runner I know in my heart I SHOULD BE. And I going to attack these goals this summer. I'm going to give myself some time off distance training before I refocus myself on reaching my goals. I am going to rely on the runners who I respect so much- my brother, Leah, Corey, Lauren and Emily. Together with Becky, we are going to finish a marathon PROUD of our efforts. Yesterday I was one of the lucky people who ran the 115th Boston Marathon. 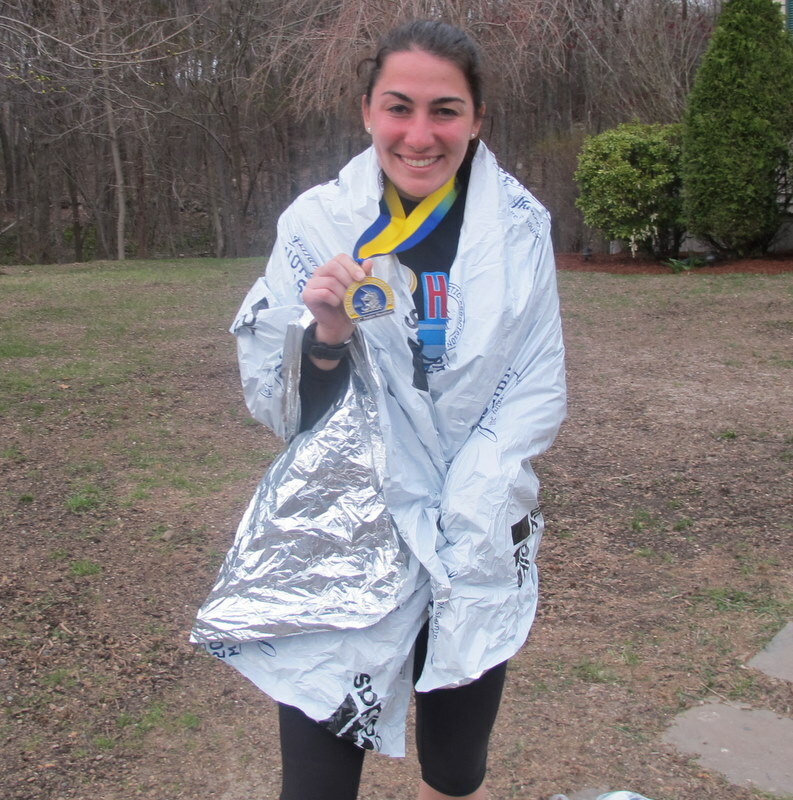 In less than 6 months I have run two of the most prestigious marathons- New York and Boston and I couldn't be more thankful. It wasn't easy and it wasn't always fun, but with the support of my close friends and family, I was able to finish the grueling race in 4:26:25 only two minutes off my PR. As most of you know I got the number late and I wasn't training for a spring marathon. 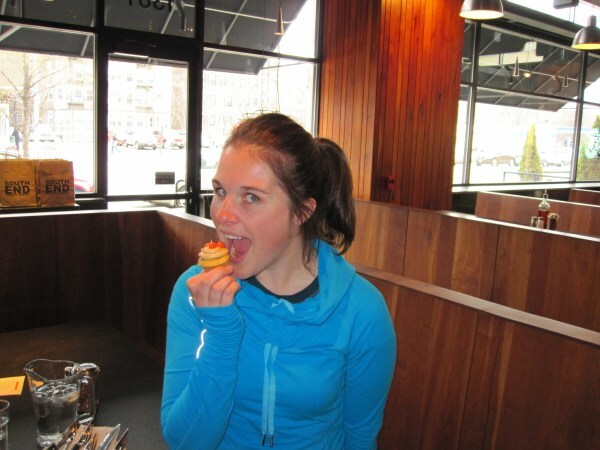 Truthfully, I was only training for a National Half Marathon PR (which I did). 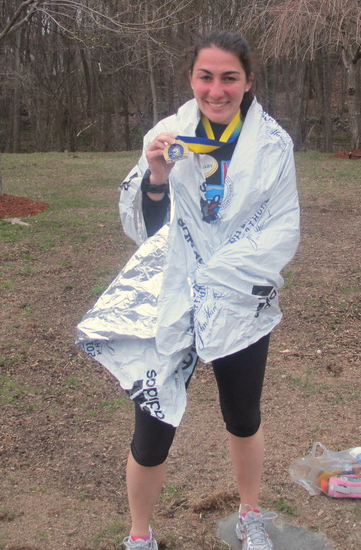 I ran several 10-13 milers in training but only two legit Boston marathon training runs- one 16 miler and one 20 miler. Two weeks ago I was supposed to run another long run, but was so sick. So in hindsight, I should be pretty proud at what I was able to accomplish but I wish it felt easier. The day didn't start that early unlike NY. Corey informed me that we could take buses from Hopkinton State Park. The park is only about 12 minutes from my house so I didn't even leave the house until 8am. It was genius to take that bus. Thanks Corey!! I had a wonderful time hanging out with Corey before the start. She is one of the most calming people I know so it was fun to spend time together before the race. (I'd show you the pics of us hanging out and athete's village but those pics are on my camera that are lost in my race bag- more on that later...) However once they called Wave 3 to leave Athlete's Village, I started to get a bit frantic. I couldn't find my bus before the start and I actually never did find it. I ended up handing off my bag to a volunteer who said he would get it to my bus. After that fiasco, I didn't get to my corral until 10:40 which was my start time. The beginning of the race was fine but I felt hot RIGHT away. Right away I thought I was overdressed. I also started drinking gatorade almost immediately. I knew the areas we were running the first part of the race REALLY well. Which should have helped me, but I felt almost bored. Hopkinton was quick. Framingham is kinda ugly and dirty. (I hope no one takes offense to that- parts of Framingham are gorg, just not what we ran through). Luckily even though I wasn't feeling the best, my friend Kristen jumped in with me at 6.5. I told her right away I felt off. We took some walking breaks, I told her I wanted to drop out, wanted to quit. Kristen ran MCM a few years ago and went out too hard and ended up being in a negative place early in the race so she felt my pain. But she reminded me that I would regret dropping out and that 15 minutes after stopping I would want to jump back in. So I powered through. 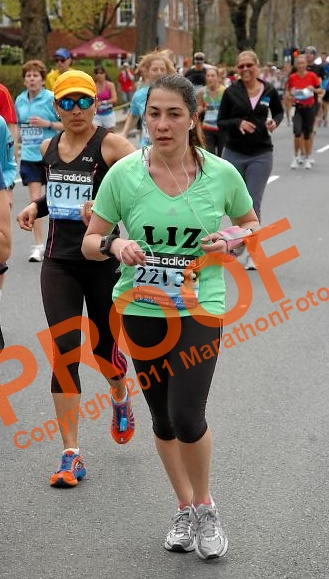 I was definitely worried how awful I was feeling so early in the race. 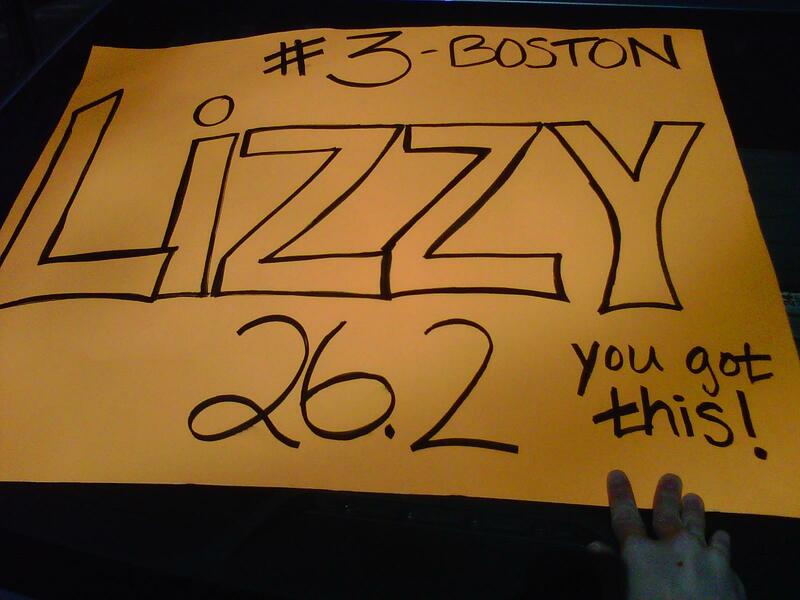 I ran into my mom around Mile 8 and handed off my gloves. In Natick Center at mile 10, I saw Dave. He snapped some great pics and I gave him a kiss and went on my merry way. I was still SO hot. The sun was beaming over my head. I was wondering where the wind was because I didn't feel it. Through Natick Center I saw more of my high school friends including Stef and Nancy and seeing them made me so happy. Kristen was supposed to drop off around there but she didn't want to leave me until I had someone else- she was seriously worried I would drop out. Yes, that is how bad I was feeling! When you know the course as well as I do it can be a curse because I COULD easily get home. (Luckily I didn't drop out!) I ran through Wellesley and hit the halfway point. I came through the half at 2:05. My goal was to come through at 2 hours but at my mental state I was proud I was still running. All goal times went out the window and I was just trying to concentrate on finishing. Once I came through the half, I was finally able to start counting down miles. 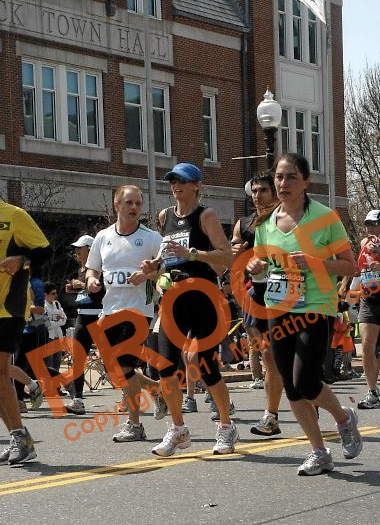 Just before Mile 15 at Marathon Sports in Wellesley, I saw my best friend Courtney and said goodbye to Kristen. Awesome sign made by Court! Courtney chatted my face off and made me forget I had just run so many miles. I started to feel better and more positive and I LOVED the enormous downhill on route 16. 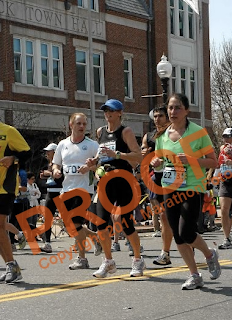 Then we had some rolling hills getting to Comm Ave. At Mile 17 I saw my brother in the crowd and he jumped in and joined us. Having two of the most important people in my life running next to me made me so happy. Together we tackled the first Newton hill and had fun together. 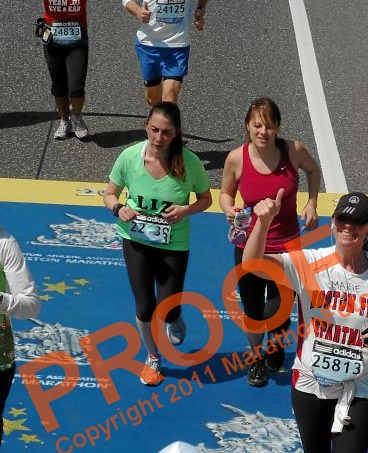 Around Mile 18, Courtney turned around as Mike and I carried on. I was definitely struggling on the hills but I was looking forward to the downhills. Right before Heartbreak at Mile 20 I saw my favorite On-the-Run-Girls and they quickly threw down their posters and jumped in with us. Lauren and Becky told me they wanted to run me home on Saturday and I was SO excited. I absolutely had an entourage running with me and it was a blast. Those last six miles were some of the most fun miles I've ever run. LOVE THIS PIC of you Becky! My brother, who ran with me even though he was sick, jumped out of the race around mile 23 near his apartment and Lauren, Becky and I carried on. I cannot thank the girls enough for being there for me. I remember I kept asking them if they were going to be dissappointed in me if I didn't PR. Ridiculous I know. Once we turned onto Hereford, the girls jumped off course and I tried my best to sprint to the finish. I was just so happy to cross that line. 4:26. 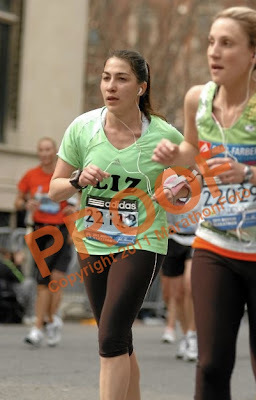 I ran my first marathon in 4:28. Second in 4:24 and third in 4:26. Hey, at least I'm consistent. I saw my friend Stef at the finish and I remember telling her that was it. 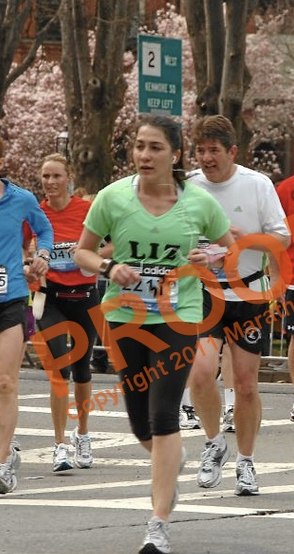 No more marathons for me. Like Sammi Sweatheart, "I'm done." (Mike that's for you!) I'm not sure I believe that today, but I need a break from the marathon. I'm not sure we're good for each other. But I'm so unbelievably happy I got to experience this race. Although I never felt great, I was so proud of myself. After the race I met back up with Becky and Lauren. My bag had gone missing so I was lucky they had extra clothes to share with me! We then headed out of Copley Square towards the Park and met up with Mom-on-the-run who snapped this pic. It was smart thinking to leave the area because we were able to get right into Fajitas and Ritas - one of my fav Mexican places near my office. First piece of business- Mango Magheritas! Cheers to my 3rd marathon in less than a year! Dave snapped this picture when we got home. Can you tell how burnt I am? My face is so RED and I'm also rocking a sweet Farmer's Tan but only on my right side. 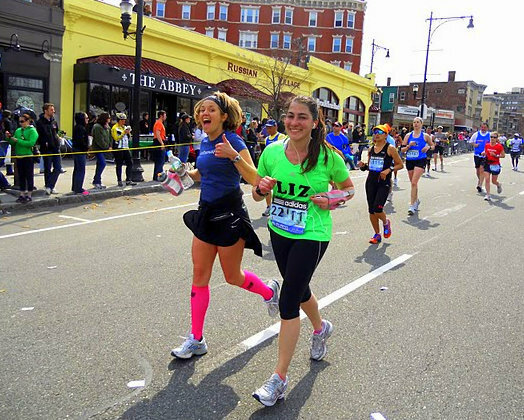 Now I'm not going to answer this publicly- but I do have a question for those runners who have ran both the NY and Boston marathon. Which one do you like better? Thanks so much to Emily, Kimmy and Tina- I "borrowed" some of your photos! 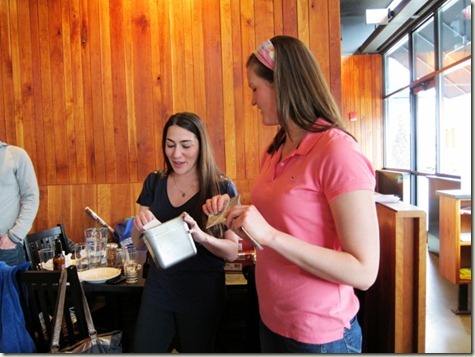 Yesterday, Kimmy and I threw a Running Blogger Meet-Up at Cambridge 1 in Fenway. Awhile ago, my friend Kimmy and I decided we wanted to plan a blogger meet-up Marathon weekend. Back when we started planning, I was going to be a spectator so I was going to have plenty of time to help organize. Then I got a number and things certainly shifted. Kim and I planned the party together but she certainly took the lead in the last few weeks and I couldn't be more thankful. (You are the best swimmy, love you xo) The party ended up being a huge success and it was so much fun hanging out with so many running bloggers from all over the country who share the same interests as me! 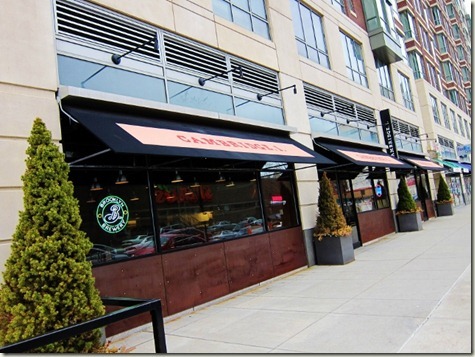 Held at Cambridge 1 in the Fenway area of Boston, bloggers took over half the restaurant around 2pm. 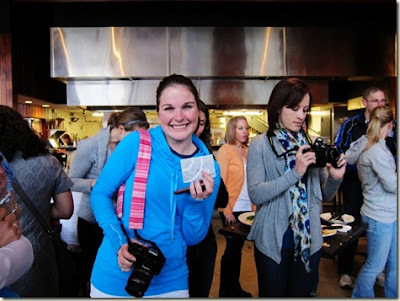 I had so much fun hanging out with bloggers from all over the country! And of course it's always fun to hang out with my on-the-run girls! I've become super close with the girls below and it's so awesome to have such close friends who share the same passion for running! Emily (sweatonceaday), Lauren (healthontherun), Bekah (runtrackmind), Corey (runnerscookie), Becky (beckontherun), and me! Cambridge, 1 generously provided pizzas and they were delicious. 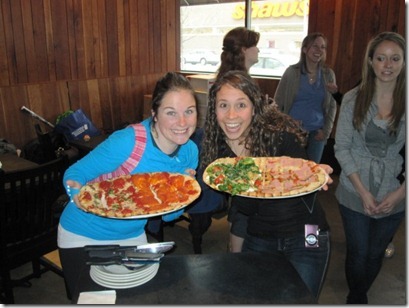 A variety of vegetarian and meat pizzas that were perfect for our group. And Swimmy made cupcakes. She is soooo impressive!!! She made cookie dough and peanut butter cupcakes and they were DELICIOUS! I think I ate three! I think having a dinner/cupcake party is necessary in the NEAR future. And a big highlight of the night was our goody bags and raffle. Kim and I used some contacts we had to pull together a great goodie bag. We also blindly contacted some companies who were more than happy to help out! 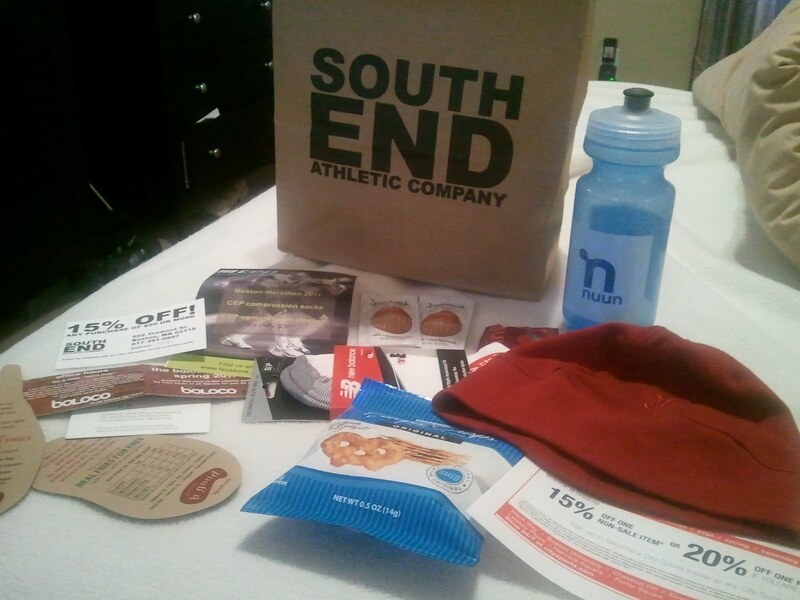 B Good, Bolocco, Ibex, City Sports, South End Athletic Company, CEP Compression Sleeves and Socks as well as New Balance running socks, Ibex hats, Nuun Water Bottles and samples, Justin's Nut Butter and Pretzel Crisps! And we also had some AMAZING giveaways! 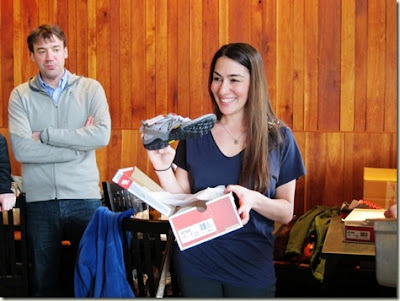 We gave away EIGHT pairs of New Balance Minumus shoes AND 3 Giftcards- TWO to SEAC and ONE to City Sports. We had everyone put there name in a bucket and we randomly selected. All the giveaways were pretty amazing and we feel pretty lucky that our sponsors were so generous! And the girls loved their Ibex hats! Overall, it was a SUPER fun event. I loved meeting so many other running bloggers! I hope we can do more events like this in the future! 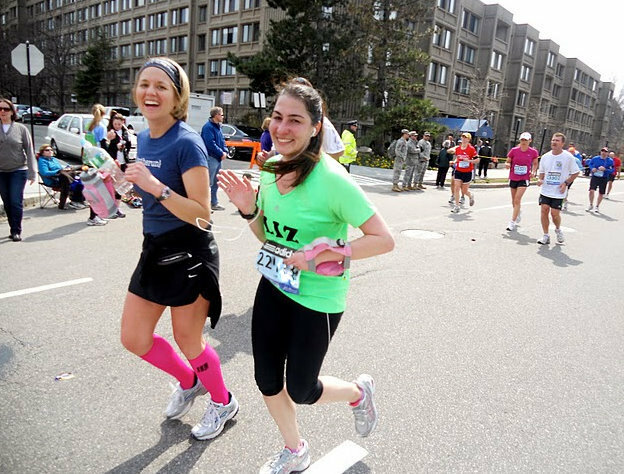 What's your favorite running blog or blogs? And your favorite running clothes/shoe brand? Look for me tomorrow, I'll be in GREEN! I'm READY to rock this : ) Stay calm and carry on! 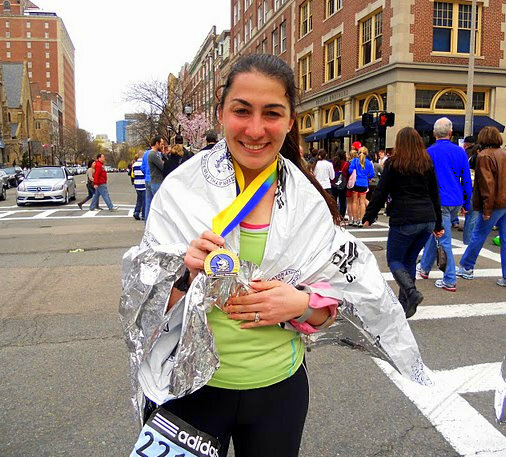 Last Run + Runner Bloggers! Speed Workouts & Cambridge, 1!